Palms Book State Park is a publicly owned nature preserve encompassing 388 acres (157 ha) in Thompson Township, Schoolcraft County, in the eastern Upper Peninsula of Michigan. The state park is noted for Kitch-iti-kipi, the "Big Spring" of the Upper Peninsula. The park was created in 1926 when John I. Bellaire arranged for the sale of a 90-acre (36 ha) parcel from the Palms Book Land Company to the state for $10. The arrangement called for the establishment of a park that would be named after the land company. During the 1930s, workers with the Civilian Conservation Corps assisted in making park improvements that included construction of an observation raft, dock, and ranger's quarters. Kitch-iti-kipi, the spring, is a pool of clear water 400 feet (120 m) across in its largest dimension, and up to 40 feet (12 m) deep. The spring water can be seen from above as it wells upward through the pond's bottom of bedrock limestone and sand, creating a continual pattern of random eddies and cross-currents in the depths of the pond. To the Anishinaabe people that were the original inhabitants of much of the Upper Peninsula, this site was a place of mystery and wonder. The water is 45 °F (7 °C) in both winter and summer. Since the days of the Civilian Conservation Corps in the 1930s, the state has operated a manually propelled observation raft on which visitors can ride. The raft, which is fixed by cables, pulls out into the spring pond and allows the depths of the pond to be seen from above. The pond is stocked with trout. More than 10,000 gallons (40,000 liters) of water per minute pass from the pond into nearby Indian Lake. Palms Book State Park protects approximately 1 mile (1.6 km) of lake frontage. ^ a b "Palms Book State Park". Geographic Names Information System. United States Geological Survey. ^ a b "Palms Book State Park". 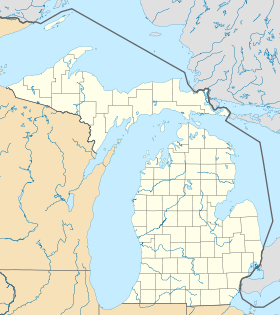 Michigan Department of Natural Resources. Retrieved March 13, 2018. Wikimedia Commons has media related to Palms Book State Park. This page was last edited on 13 March 2018, at 17:30 (UTC).